Weave 20 baskets with this CAMP KIT. 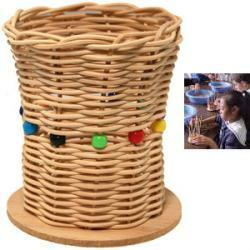 Includes twenty 4"pre-drilled bases, beads, one easy-to-follow pattern & enough #3 round reed to weave 20 baskets. (Same pattern as Kids Kit) Need reed & bases for more kids than 20/30? Order extra bases from the Teachers Special page and extra #3 round reed from the reed page. Be sure to vist our Weaving with Kids page. This page has all the teaching & preparation tips that you need to make this project a huge success! Camps, Schools and Vacation Bible Schools use this kit with great success year after year. If you need to weave a few more in addition to this kit (but not enough to order the Classroom Kit for 30), order extra drilled-hole bases and a pound of #3 round reed. I recently hosted a group of 9 families in Sequoia National Park. I bought the kit for 20 baskets with beads for the kids coming - ages 3-14. Of course the kids 5 and under needed a bit of assistance from their parents, but everyone was challenged and truly enjoyed making their own unique baskets. The tips on the site as well as accompanying the directions in the box were incredibly helpful. My daughters and I cut and wound up about 50 sets of reed about 15 inches long to get us all started. And while the children were making their baskets, more parents cut and wound and soaked the next batches. I can't thank you enough for supplying me with EVERYTHING necessary to help these kids weave and finish their very own first baskets to take home as the best memento from our camping trip. Thank you VI Cane & Reed Co.